Selkirk College Saints forward Chris Breese (left) and his teammates will return home to the Castlegar & District Recreation Centre for a pair of games against rival Vancouver Island University on Friday and Saturday night. With four games left in the British Columbia Intecollegiate Hockey League (BCIHL) regular season, the Selkirk College Saints have already transitioned into a post-season frame of mind. The Saints return to the Castlegar & District Recreation Centre for the first time since early-January for a weekend series with the Vancouver Island University (VIU) Mariners. On the line for the heated rivals is the coveted home-ice advantage when the playoffs begin on March 8. The teams are currently sitting second and third in the league, with the Mariners holding a two-point advantage. The Saints returned to the West Kootenay this past weekend after splitting a weekend series with first place Trinity Western University (TWU) at the Langley Events Centre. In the Thursday night game, the Saints jumped out to a 2-0 first period lead on goals by Dylan Heppler and Sawyer Hunt. After TWU scored the only goal of the second period, Edward Lindsey gave the Saints a 3-1 lead early in the final frame that would hold up as the game-winner as the visitors came away with a 3-2 victory. 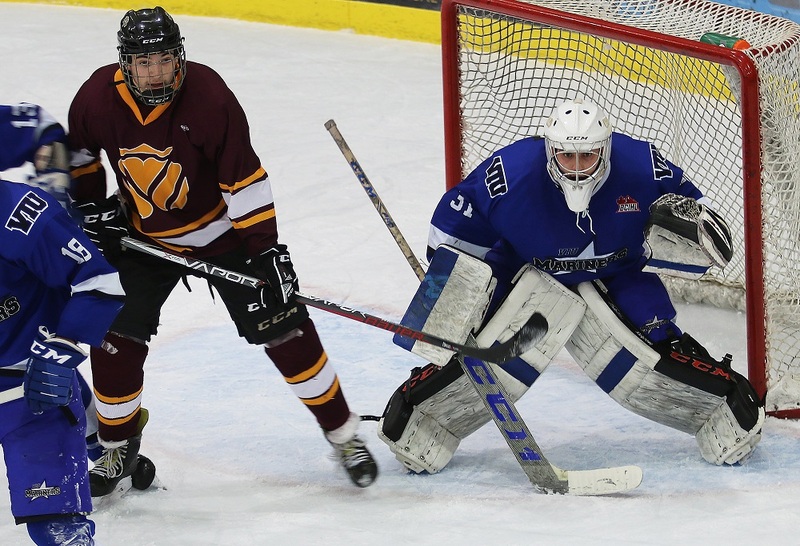 Saints goaltender Patrick Zubick was stellar between the pipes stopping 31 TWU shots. In a wild rematch on Friday night, the game went back-and-forth before the hosts eventually came away with a 7-6 win. Devin Nemes and captain Jackson Bruce-Fuoco scored two goals each with Tayden Woods and Chris Breese adding singles. Saints goaltender Tallon Kramer stopped 28 shots in the loss, including 15 in a potent first period to keep his team in the game. The Saints have battled injuries and line-up changes all season long, but stability is starting to return as the team hits the stretch drive to the post-season. The second semester addition of Nelson native Sawyer Hunt and return of Brady Ward has proven positive for the team. And after hand injuries kept assistant captain Tyler Hartman and defenceman Cole Arcuri out of the line-up, both are expected back before playoffs begin. This weekend’s series against the Mariners is expected to by a typically feisty and high paced affair. The Mariners—who have several former Saints on their roster—are currently on a three-game winning streak. With both teams solidly occupying second and third in the standings ahead of Simon Fraser University, the odds are this is also a first-round playoff preview. The only question is who will be traveling come early-March. The Saints will host the Mariners on both Friday and Saturday night at the Castlegar & District Recreation Centre. The puck drops at 7 p.m. on both nights. Because of a light February schedule, the Saints have arranged a couple of exhibition games against the Rossland Sr. AA Warriors that will take place on February 16 in Rossland and February 23 in Castlegar.